The new generation of EVGA GeForce GTX 970s has arrived with the FTW+. This enhanced model offers an included backplate, improved cooling, double BIOS support, new display output configuration and 6 Power Phases for robust overclocking support. 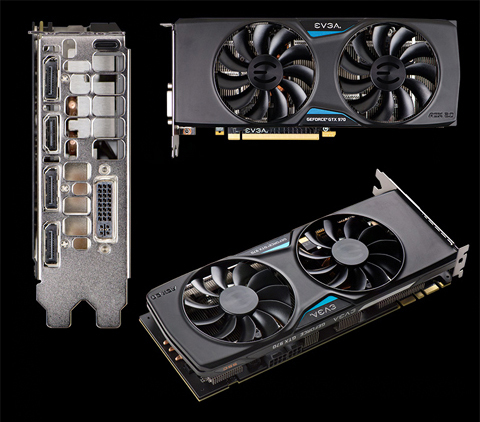 These new cards also feature EVGA ACX 2.0 cooling with optimized swept fan blades, double ball bearings, and an extreme low power motor. The EVGA ACX 2.0 cooler offers more air flow, with less power, unlocking additional power for the GPU. Fans only run when necessary and turn off during idle. This means the EVGA card is completely silent when you're not gaming! Multiple integrated BIOSes allow you to tweak and troubleshoot with ease. The secondary BIOS also has an alternate fan curve, allowing for ultimate cooling performance. Full size cooling base plate makes contact with GPU memory and MOSFETs, reducing memory temperature up to 14% and MOSFET temperature up to 48%. Includes EVGA's popular and FREE overclocking utility that lets you adjust voltage, change clockspeeds, monitor your card and more! *Minimum system power requirement based on a PC configured with an Intel Core i7 3.2GHz processor.